Well, it is appropriate that this week's topic is on fit because I could definitely use some help with the fit of my Peony wearable muslin! But first let me warn you: this is not a Halloween costume. I ordered some fabric online that was a dark gray color. When I received my order, the fabric was a blueish doctor scrub looking color. No, my name is not Doctor Crayola Creepy! 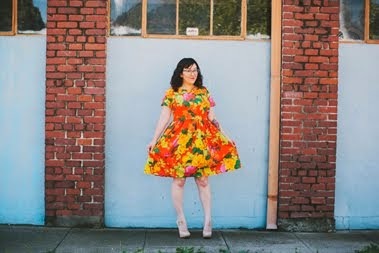 Don't wear heels on the grass while taking pictures of your scrub dress! You will sink in the mud! The fit feels fine in the waist, but is a little baggy on top. 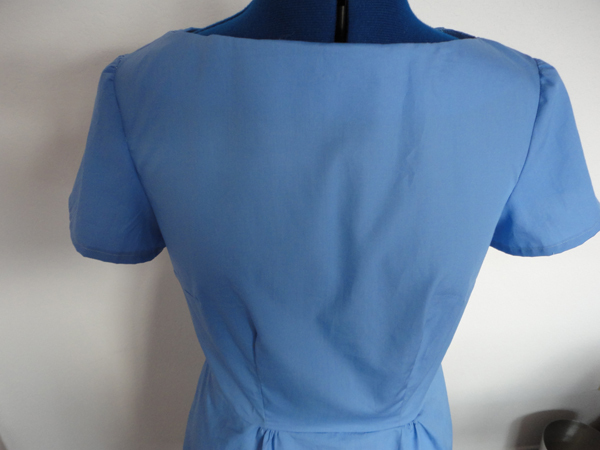 The horizontal wrinkles on the sides are pretty prominent, so I'm thinking that shortening the bodice a bit may help. What do you think? It's not too late to sew along with us! You should see my Peony muslin - I had given up on this pattern once before and almosy did this time. I think I might have conquered the bodice fit. I'm not getting too excited. I'm just sewing together my first version and crossing my fingers. I just made a bodice for the muslin - you should see the lines all over it!!! It looks like a street map! I'm crossing my fingers for you too! the skirt fit looks perfect. could it be a little wide in the shoulders which is causing the wrinkles? (of course i could be saying this as i have the opposite problem - my wearable muslin has a horizontal wrinkle which i think is because i need a wide shoulder adjustment). the bodice doesn't look too long to me - i often find with colette patterns that i need to increase the darts at the top just under the bust. i found a great tutorial (i thought it was gertie but i can't find it!) where you increase the dart at the top and it finishes at the same place at the bottom, so you are changing the shape of the dart. can't even work out what to google for it tho! annoying as i wanted to use for my final peony! I agree, looks a bit wider on the shoulders . Yes, you seen to have same issue I have on the back, do short it a bit. marrieB - thanks so much! that was it! I had this problem with my Macaron and I shortened the bodice and that helped. It may be wide in the shoulders too like Sew little time said, hard to tell from the pics. The skirt looks great! I actually like the color! I work in a hospital too. lol You should check out my hideous muslin fabric! I may post about it when I get it finished. So at your work do people wear scrubs that look like my dress? haha. And post about your muslin! I want to read! Looks like it is going well! You are so cute when you pose--even a scrub dress is darling on you ;) sorry I can't help with fit... My only thought is that a slightly more drapey fabric might help, but you probably want to tighten up the fit some too! Yep, I think you should take a little horizontal tuck out of the bodice above the bust, and you may want to remove a little from the shoulder-- it looks like the sleeve is sitting just a bit past your shoulder. This style is SO cute on you! I can't wait to see your finished version! Thanks, Ginger! I'm definitely going to do something about the shoulders. I made so many adjustments on this bodice - size 14 with FBA, straight size 14 with dart adjustment, size 10 with FBA and I shortened the bodice on all. I just finished one with the slightly altered 14 and it looks fine (i.e. wearable) but the 10 I think fits the best. So frustrating! I love the pattern but it's been a headache! The bodice fitting on the Peony has been a bit problematic. I have found the wide neckline has made things a bit loose in places. Perhaps try shortening the bodice and see if that makes a difference? Good luck. STAT! 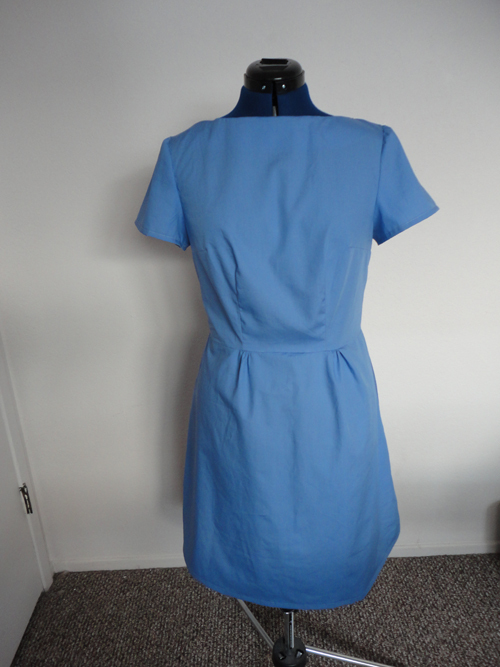 Wow, I think for a wearable muslin the fit is pretty decent :) I'm sure with a few tweaks it'll look really awesome! I've been steadily getting through my fit issues with the bodice. I did a post on it with some pictures, but it's pretty summarized with what I needed to change. I didn't go into all the details of every little thing I did just because it was so extensive. I had to lengthen the bodice about 2 1/2 inches, and I had similar issues with the gaping front so I did a horizontal tuck, which worked wonders. I had to completely move the darts down and over, and widen the darts along the back neck to fix some gaping issues around my nape. I still need to fix the shoulders and then slightly widen the neck for balance as Colette patterns tends to be way too tight around the arms for me, but I'm dreading redrafting my armhole and sleeve pattern...I guess that will be my Saturday project. I'm drafting a different skirt as I want a fuller one. However, the original skirt looks quite cute on you. I like the shorter length...very cheeky. My wearable muslins are never this cute. :D I think the fit is "fine" (which is what you get in stores, amiright?? :D ) but if you wanted a more perfectly fitted bodice, then I think going down a size in the shoulders might be the trick? I have to do that with boatneck styles and I have linebacker shoulders. ha. Your write up was awesome! When I am working on another muslin (number FIVE) tonight I will be referring to your post. Thank you!